You might say that divine intervention was responsible for Omar’s decision to start selling on Amazon. That is one way to look at it, at least. Because as it happened, Omar first learned about selling on Amazon at, of all places, his local church. As he told us, his church, which had invested in a sticker press, was doing brisk business selling stickers and custom decals on Amazon.com. And, having achieved this success themselves, the church was eager to share what they knew with their parishioners. With that in mind, the church began holding weekly seminars that gave individuals like Omar the information they needed to get started with their own business. These seminars proved to be just the spark that Omar needed. Omar had been speaking with lot of folks who were seeing success with e-commerce businesses, using models such as affiliate marketing, dropshipping, and multilevel marketing. More broadly, business is something that had long been on Omar’s mind - a business administration major in college, Omar had flirted for some time with entrepreneurship, including, at one point, dreaming of opening a restaurant franchise. But it was not until Omar heard about Amazon FBA that he felt prepared to take the plunge. The more he learned about Amazon businesses, the more he felt like it was the place that a first-time entrepreneur like him could and should start. Once he made the decision to jump in with both feet, Omar--like all new sellers--faced an important decision: what product should he sell? The place to find inspiration for product ideas, he realized, was with niches he already knew well. And that meant starting from the place where it all began: the sticker press at his local church. With that in mind, Omar began by looking into what stickers were selling well online, both on Amazon specifically and the web more broadly. In addition, his church gave him some helpful advice on the type of stickers he should sell, based on what was selling well and what would incur costly storage fees. In time, Omar came to find that product research was time- and labor-intensive, and he began exploring whether there were tools out there that could automate his research process. As he did so, he came across a number of Amazon product research tools, including AMZScout. After considering his options, AMZScout, he realized, could not only help him identify underserved product niches but also give him a snapshot as to his expected profit in those niches. In the end, he said, signing up for the AMZScout Chrome extension was a no-brainer. With the help of AMZScout, Omar’s Amazon business is now off and running. He now offers, through his Amazon storefront, 57 varieties of stickers, including vinyl decals, bumper stickers and stickers for laptop computers. He’s currently grossing $1500 a month and plowing every dollar of profit he earns back into his business to accelerate its growth. 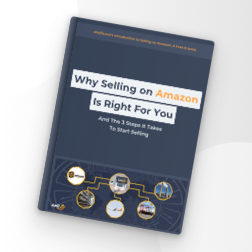 When you talk to Omar, one of the things that shines through is how much he’s already learned about selling on Amazon in the short amount of time he’s been doing so. For one thing, the seasonality of an Amazon business can be taxing for sellers, he says. Products can sell like gangbusters around the winter holidays but suddenly slow down once the new year rolls around. If you’re going to ride that roller coaster, he says, you need to be patient and not allow yourself to get disappointed when times get tough. In addition, in Omar’s view, running an Amazon business, like running any business, requires real work and dedication. While there are lots of folks on the internet touting Amazon businesses as yet another get-rich-quick scheme, the reality is that success is only possible through hard work and effort. While Omar, for instance, is pleased with the revenue growth he’s seen, he recognizes that he’s going to need to continuing launching new product lines in order to scale up his operation. Finally, managing the inventory of a physical goods store requires planning and sophistication. After experimenting with different approaches to shipping his inventory to the United States, Omar has figured out a model whereby he sends some inventory by air and some by sea. By doing so, he figures, he is simultaneously able to minimize the cost of air transportation while ensuring he always has some inventory on hand and ready to sell. All in all, if Omar’s business keeps growing at this rate--and if he keeps learning important business lessons as he goes--it may well be that he’s the one running the seminars at his church sometime soon.